Our Full Day Classic Road Trips get you behind the wheel of 5 iconic classic cars on a 7-8 hour drive through the Cotswolds, Welsh Borders or Forest of Dean. 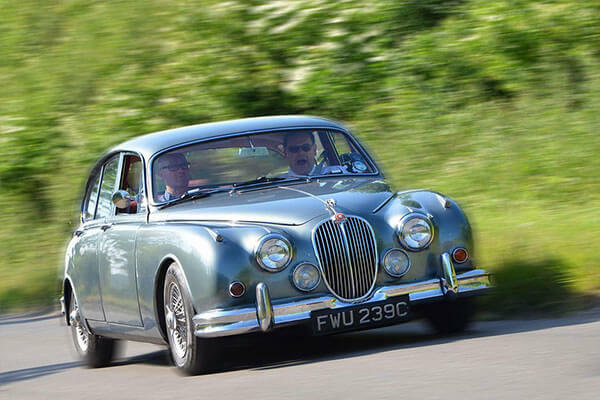 Choose between 6 different routes as well as themed experiences like our Jaguar Driving Day and Morgan Factory Tour. Each one includes the use of five classic cars including E Types, Triumphs, Alfa Romeos, Porches and MGs, plus a break for lunch. The experiences includes driving routes, fuel and the option to take a friend or family member along for the ride. Cotswolds, Welsh Borders or Forest of Dean. The vehicle(s) will be supplied with various contents including information pack, maps and guide books which must be returned with the car. This voucher is valid for 10-months from the date of purchase. We recommend booking your voucher 8-12 weeks in advance. Please allow a full day for your experience. Please note this experience cannot be cut short. You may postpone your booking in adverse weather conditions by mutual agreement with the provider. Available on selected weekdays from April to September. Includes insurance for 1 driver only (subject to a £1000 excess), with a waiver policy available for £30 extra (reducing the excess to £0). A last-minute Christmas deal on our Supercar double blast at Heyford Park. Enjoy a free passenger ride at the end after driving your 2 chosen supercars with Trackdays.co.uk. The Junior Rally Full daycan be purchased as a 10 month open gift voucher. A V10 is better than a V8 and with the Junior Audi R8 V10 experience, you will witness why it is better in every department. Drive 3 miles around the coned out track at the North Weald venue in Essex.